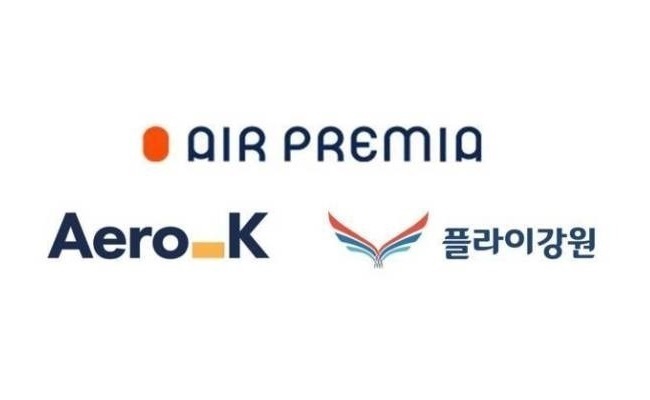 South Korea’s Transport Ministry announced Tuesday that it has designated Fly Gangwon, Aero-K and Air Premia as new low-cost carrier operators after more than three years of hiatus due to overcrowding of the local LCC market. The ministry said Fly Gangwon, Aero-K and Air Premia have passed the reinforced criteria for LCCs. Under the revision, companies planning to carry out flight operations are required to have at least 30 billion won ($26 million) in capital and five airplanes before they can begin operations as budget carriers. The previous requirements were 15 billion won and three planes. The ministry’s task force had assessed each air carrier’s capacity to secure safety, provide customer satisfaction, and manage flight routes and airport operations, the ministry said. In November last year, five new budget air carriers -- Fly Gangwon, Aero K, Air Premia, Air Philip and Guardians -- had applied for business licenses. Fly Gangwon, Aero-K and Air Premia had previously attempted to obtain operational licenses. Fly Gangwon, which has Yangyang Airport-based flight routes, had failed to meet the ministry’s requirements twice since 2016. Aero-K, which has Cheongju Airport-based flight routes, has stressed that its services would make it easier for passengers to travel around the South and North Chungcheong and Gyeonggi provinces. Meanwhile, Incheon-based Air Premia has touted its differentiated seat options, such as premium economy. Last year, the company scouted former Jeju Air CEO Kim Jong-chul to lead its business. But concerns remain as the new operators are entering an already competitive market. Korea currently has six budget air carriers -- Jeju Air, Jin Air, Air Busan, Air Seoul, Eastar Jet and T’way Air. Air Seoul was the last airline to receive the ministry’s approval, in December 2015. Government data showed that LCCs now make up 55.5 percent of the domestic flight market, up 270 times compared to 13 years ago, when the first domestic flight by T’way Air was launched in 2005. Amid the saturated market, new LCC operators may see a shortage in pilots as well as a decrease in profits, according to industry insiders. With the three new airlines, at least 15 planes will be operated, meaning that at least 60 pilots are needed. However, industry insiders said it will take time to train pilots to cover flight routes -- a process that is important to ensuring passengers’ safety. According to data from the Korea Transport Institute, approximately 300 and 400 pilot captains and co-captains are needed each year in Korea’s flight industry, but only around 350 pilots are nurtured annually.